Vaporizers have recently become more popular since rules have tightened up and smoking indoors being banned in most countries. So nowadays it is normal to see many people walking around getting their nicotine fix indoors and out with Vaporizers, whilst shopping or at work as they are far more convenient and are non offensive to others. Cannabis users have also caught on to this discrete way to be able to smoke in public without the tell tale obvious hash smell that even your granny seems to have been able to recognize (also opening up questions) ….anywayss, it also happens to eliminate some of the carcinogens and increases the THC levels up to 85% so it really is a win win situation enabling you to take your habit mobile! so lets get on and review a couple of standout units, for different reasons. This is quite expensive but it does come with some added features (that took 5 years of development) and options that other machines do not, plus it has a 10 year guarantee so it could be a good long term investment. 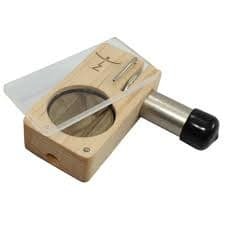 It has 4 temp settings suitable to switch between for different moisture/density buds, so you can still smoke them whether they are hard and dry or sticky and soft. It also has 2 separate heat modes so you can choose either convection which forces cool air out with a patent pended cooling system, or conduction mode which gives direct heat to the product. 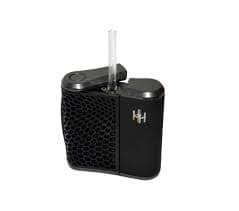 Another high tech feature that The Haze has is you can actually simultaneously vaporize 2 different products with alternative heating methods at the same time! This can give you a unique tailor made experience. The device has an LED display so you can easily see what temp setting you are on (easy to forget for obvious reasons once you get using!) and the unit will last 6 hours on a full charge so you really can allow time to fly when having fun! On first glance looks like something from the WW2 era or something your child brought home from woodwork class! So expecting a simple vaporizer, you will then not be disappointed as it doesnt promise to be anything else, press the button and within 3 seconds you are inhaling vapor. The heat level is dependent on how long you hold the battery button down so its trial and error to get levels that are to your liking and you will realise how long is the maximum time as the product will actually combust and you will end up smoking! this can be quickly put out by covering the pipe and shutting off the oxygen. So if other temp controlled devices can be compared to digital, this would be analog! For those seeking an uncomplicated smoke, especially when you might be feeling extra relaxed after you get going, this is good for you. The con would be its not discrete as not only does the look of it draw attention but you can clearly see the contents, but then again it doesnt promise to be. The company offers an amazing lifetime warranty which is suprising, and they will actually issue a replacement unit even if you broke it! Unfortunately the light is not covered in the warranty so at some point you have to understand the chamber will not be lit, which in my mind is better as its more discrete anyway.